Back in March of this year, Jaguar Land Rover unveiled its latest addition to an ever-expanding SUV range. The new Range Rover Velar. Named after the original name of the Range Rover Classic prototype, the Velar is now the fourth member of the Range Rover family, sitting nicely between the shorter wheel-based Evoque and the “baby Range Rover” RR Sport. The big question here is why? Why do we need yet another category if SUV? There are thousands of them on the roads now, with the majority of new cars sales being SUV and crossover vehicles, Jaguar Land Rover’s plans to double the number of units sold in the coming year is well and truly underway. Looks wise, there is simply no denying the Velar is a handsome piece of design. The model I drove was a top spec diesel model, the R-Dynamic HSE D300 with the added black pack and opening glass roof. From the front, it looks very aggressive with Land Rovers new mesh grill and square LED daylight running lights (a look that now being rolled out as the facelift of the RR Sport and full-fat Rangie) and the rear end is also beautifully designed. From the side, the body is longer and higher than the Evoque but the roofline is much lower and sleeker than the slightly larger Sport giving it more of a coupe-like silhouette. The retracting door handles are also a lovely touch, a lot like the ones first seen on the Tesla Model S. It gives the doors a beautiful flat profile when you look down the lines of the car’s body. 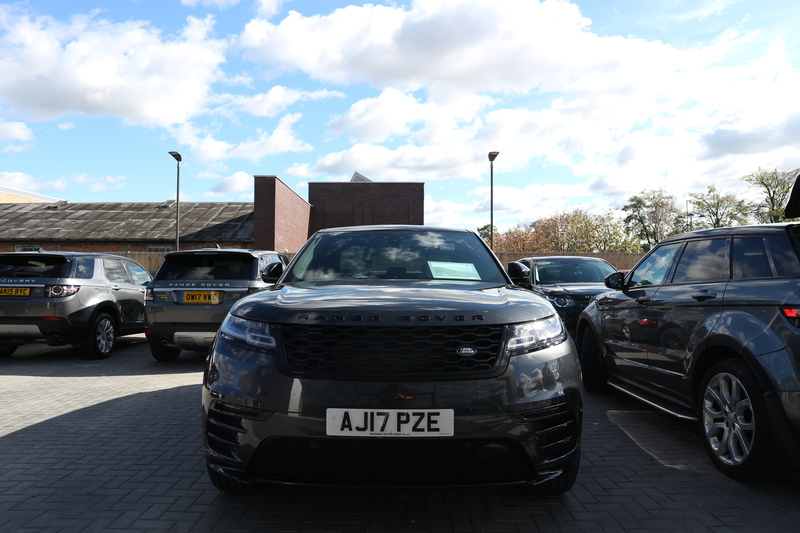 With this being a top spec model, it has the 21″ 10-spoke wheels in black along with black badges, black accents and black grills. It looks very stealthy and very intimidating in the rear view mirror or any car in front. The car may be lovely to look at from the outside, but it’s on the inside where the Velar really starts to shine. Open the driver’s door and it’s like looking into the future. It all looks very Land Rover at first, the main binnacle is now a big screen, the seats are upholstered in a plush, inviting cream leather and there is lots of piano black trim. It’s when you actually get in the car and you start to look a bit closer and it starts to appear a bit different. Where there used to be various knobs and buttons to control things like the infotainment system, the climate controls and various other settings, there is now another screen. Land Rover calls it the Touch Screen Duo, and it basically gives the driver complete control over all various settings of the car through two interactive 10-inch touchscreens. It allows you set up to adjust the media settings without interfering with the navigation screen above and you also set the various comfort and driving settings through this interface. Another little addition includes the new steering wheel controls. Again, conventional buttons have been replaced by touch sensitive pads on either side of the wheel that illuminate and adjust depending on what you are doing, like changing the media volume or selecting a different radio station etc… Since the release of the Velar, Land Rover has since announced that all this new tech will feature in the face-lifted Range Rover Sport and the full-fat model. It is very cool, and it’s great fun to play around with when you’re sat stationery, but I can see it become more of a problem when on the move. I sometimes feel that manufacturers are overcomplicating car interiors in the pursuit of clean and minimalist dashboards. One thing I noticed while driving that car was that with the glass roof open, all you can actually see on the display is the reflection of the sun and all the grubby fingerprints. I can also imagine this becoming very distracting and potentially dangerous for the driver as it is just another thing to distract you from the road. Maybe I’m an old man but I’ve never felt the need to take away the old knobs and buttons, I have a kind of “if it ain’t broke, don’t fix it” view on them, but I do also understand that I am not the majority target audience. Words and photos by James Ford.